‘Clean Eating’ is the new buzz-phrase in nutrition. Endorsed by countless celebrity dieters and fitness professionals filling Instagram with image of mashed avocado and raw brownies, this so-called new way of eating revolves around ‘clean’ foods and the avoidance of anything highly processed and sugar-laden. On the surface, this seems like a good idea and is certainly the sort of approach I would normally endorse: avoiding refined processed foods and eating a wide range of natural, nutrient-rich goods instead. But dig a little deeper, and you find the world of clean eating is far murkier than it likes to appear. “Processed foods are anything in a box, bag, can or package.” So you’re going to have to carry that free-range chicken home in your bare hands. And yes, you are indeed being ‘dirty’ by choosing lentils and chickpeas from tins despite the fact you haven’t got time to be soaking and simmering dried ones for hours. “Clean foods are naturally low in sugar, salt and fat.” Statements like this perpetuate the widespread confusion we have over low-fat foods. 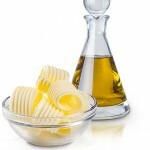 Trans fats and refined vegetable oils disrupt the actions of healthy fats in our bodies, but regular consumption of butter, ghee, good quality olive oil and coconut oil brings many health benefits. 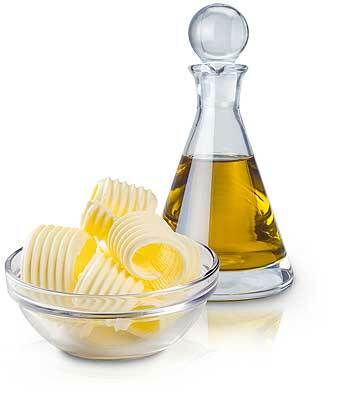 And in terms of the so called ‘clean foods’; avocadoes, coconut oil, nuts and seeds are brimming with fats! “Use clean sugars.” I don’t think I understand this one at all. Sugar comes in many guises and in various states of processing. Avoiding the refined white table sugar is certainly helpful, but replacing this with huge spoonfuls of agave syrup (often favoured by clean eaters) is not a good alternative given its high fructose content. Fructose is metabolised in a different way to regular glucose, with high levels contributing to the formation of triglycerides in the liver – long term issues with this include Non Alcoholic Fatty Liver Disease. A ‘Clean Eating Pyramid’: the science behind this pyramid evades me. It encourages the majority of the diet to be based on fruit and water – great if you want erratic blood sugar levels, bloating and diarrhoea. Not so great for supporting your body in dealing with stress, hormone fluctuations, ongoing fatigue or digestive issues such as IBS. 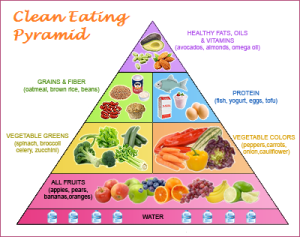 The biggest disagreement I have with ‘clean eating’ is the phrase itself. It implies foods are either clean or dirty, and therefore, by extension, YOU are either clean or dirty, according to your food choices. It is yet another way in which food becomes demonized. It is yet another way for eating disorders to develop, as people (mostly young women) begin to restrict and control the foods they eat, obeying rules set out by other followers on social media, each trying to outshine the other with the latest images of their ‘clean’ meals. For me, dirty foods are the carrots I haven’t washed yet. I enjoy mashed avocado as much as the next person, and just as much as I enjoy a bag of ‘dirty’ chocolate buttons at the cinema.